Hey, remember Bubsy? He had two platformers on both SNES and the Sega Genesis (or Mega Drive) back in the '90s. I think it's fair to say he was a failed mascot, especially with Bubsy 3D widely considered one of the poorest PS1-era games. 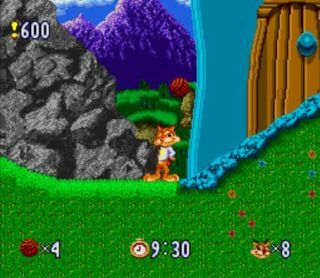 He must have some friends out there though, because studio Retroism has happened upon the rights to Bubsy and wants to bring him back. That effort begins with a Steam Greenlight page intended to gauge interest in a re-release of the first two 2D platformers. According to the studio they've "cleaned him up and given him a new lease on life." "Bubsy’s journey to redemption begins with your vote to bring two of his 2-D games to authorized digital download for the first time in the Bubsy Two-Fur on Steam," the Greenlight page reads. "With your support, Bubsy may finally be able to look himself in the mirror and smile, carry himself with dignity, and perhaps find the strength within to go on new adventures again." As that last paragraph hints, it looks like Retroism might revive Bubsy if the reissues find some success. Will they, though? I don't think either of the 2D platformers are remembered particularly fondly, but nostalgia is a powerful thing.